This title includes new essays by a range of leading theorists on the interdisciplinary study of literature and history. "Literature as History" presents a selection of specially commissioned essays by a range of key contemporary thinkers on the interdisciplinary study of literature and history. Chapters include: Catherine Belsey on Historicism, Helen Carr on Modernism, Terry Eagleton on tragedy, John Lucas on the First World War, R. C. Richardson on Servants in the 18th Century, Judy Simons on Rosamund Lehmann, and Stan Smith on Edward Thomas. The unifying theme is the interrelationship between literary/cultural production and its historical moment. The essays in the collection are astute and exciting in terms of their engagement with ever-changing developments in critical and theoretical practice while retaining an invaluable focus on familiar and engaging texts and authors. The contributors offer a reappraisal of the nature of literary studies today, looking back over the thirty-five years of Peter Widdowson's career - a career which has coincided with the emergence of, challenges to, and reformulations of critical theory - and ask what the future holds, particularly for the interdisciplinary ways of working which Widdowson pioneered. Bringing together distinguished scholars in the interdisciplinary study of English and History, it seizes the opportunity to take stock of the current field of literary studies and to ask searching questions about its future development. 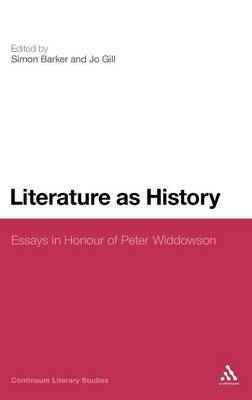 "Peter Widdowson was one of the architects of the revolution in English Studies, and this comprehensive tribute celebrates and commemorates all that is best in the rich legacy of his work. These essays and moving personal reflections, by leading scholars and colleagues, stand as an impressive testimony to the comprehensive range, critical engagement, indefatigable political commitment and innovative interdisciplinarity, that have been the hallmarks of Widdowson's lasting contribution as editor, cultural critic, literary historian and theorist. Collectively they appraise and reinforce his sustained influence across a wide range of topics within the sphere of the dynamic interaction between Literature, History and Politics, that has exerted a major influence on the intellectual trajectory of the Humanities in recent years. Each of these fine essays stands alone as a real contribution to knowledge, but all recognise and reprise Widdowson's invaluable and carefully poised contributions to the advancement and the transformation of English Studies over four decades." "Unlike most anthologies celebrating the work of distinguished scholars, this volume is very much of our moment and can be recommended as an historicised state of literary studies. Its themes are war (Lucas, Martin), religion and revolution (Eagleton, Saguaro), time and history (Dentith, Randall, Stan Smith), class and inequality (Richardson, Simons). Its critical methods include critiography (Widdowson's own term), historicism (Belsey), historicised metacritical analysis (Carr), and critical realism (Dolin). In the last decades of the 20th century, the learned and ludic Peter Widdowson was in the vanguard of those who redefined "English" as a subject. His specialisms were Hardy, Theory, History, and Literature as History, making it rather than merely reflecting it. The contributors here continue his traditions of reasoned argument and debate, even arguing with Widdowson himself. This is a memorable as well as a commemorative collection, including poems to Widdowson by Smith and U.A. Fanthorpe, and the final section of Personalia includes enough love and admiration for any profession."